AWS Fargate is a technology that allows you to focus on running your application without needing to provision, monitor, or manage the underlying compute infrastructure. You package your application into a Docker container that you can then launch using your container orchestration tool of choice. Fargate allows you to use containers without being responsible for Amazon EC2 instances, similar to how EC2 allows you to run VMs without managing physical infrastructure. 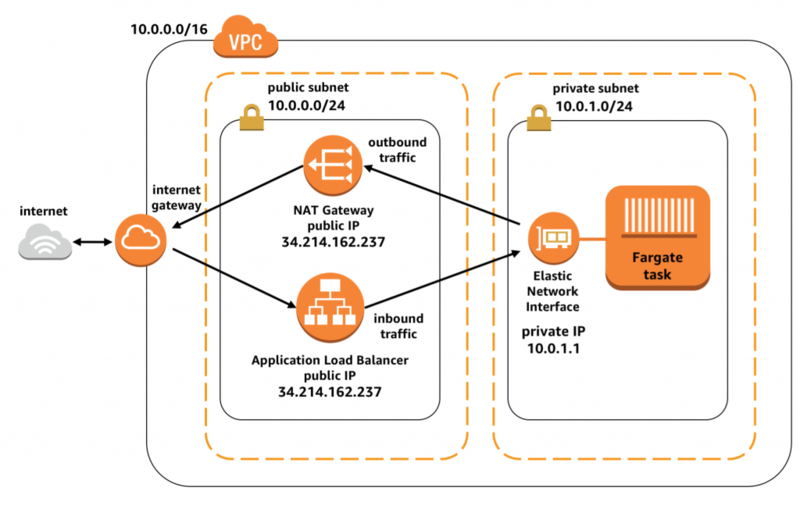 Currently, Fargate provides support for Amazon Elastic Container Service (Amazon ECS). Support for Amazon Elastic Container Service for Kubernetes (Amazon EKS) will be made available in the near future. Despite offloading the responsibility for the underlying instances, Fargate still gives you deep control over configuration of network placement and policies. This includes the ability to use many networking fundamentals such as Amazon VPC and security groups. 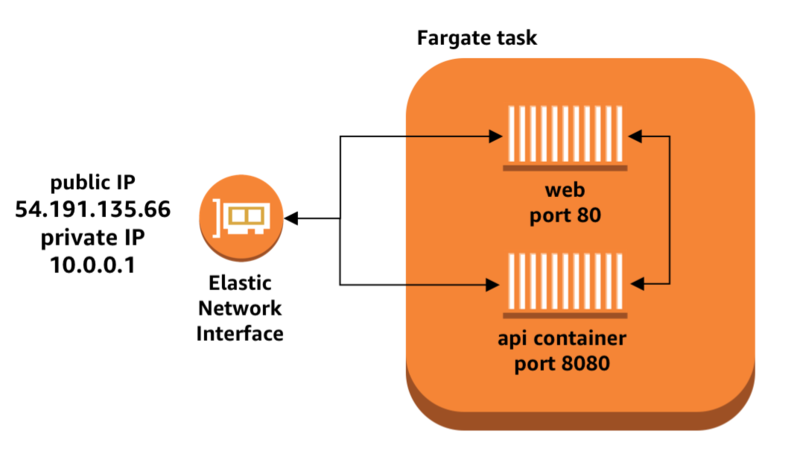 This post covers how to take advantage of the different ways of networking your containers in Fargate when using ECS as your orchestration platform, with a focus on how to do networking securely. Container networking is often used for tightly coupled application components. Perhaps your application has a web tier that is responsible for serving static content as well as generating some dynamic HTML pages. To generate these dynamic pages, it has to fetch information from another application component that has an HTTP API. One potential architecture for such an application is to deploy the web tier and the API tier together as a pair and use local networking so the web tier can fetch information from the API tier. If you are running these two components as two processes on a single EC2 instance, the web tier application process could communicate with the API process on the same machine by using the local loopback interface. The local loopback interface has a special IP address of 127.0.0.1 and hostname of localhost. By making a networking request to this local interface, it bypasses the network interface hardware and instead the operating system just routes network calls from one process to the other directly. This gives the web tier a fast and efficient way to fetch information from the API tier with almost no networking latency. In Fargate, when you launch multiple containers as part of a single task, they can also communicate with each other over the local loopback interface. Fargate uses a special container networking mode called awsvpc, which gives all the containers in a task a shared elastic network interface to use for communication. ECS, with Fargate, is able to take this definition and launch two containers, each of which is bound to a specific static port on the elastic network interface for the task. This sends a local network request, which goes directly from one container to the other over the local loopback interface without traversing the network. This deployment strategy allows for fast and efficient communication between two tightly coupled containers. But most application architectures require more than just internal local networking. External networking is used for network communications that go outside the task to other servers that are not part of the task, or network communications that originate from other hosts on the internet and are directed to the task. Configuring external networking for a task is done by modifying the settings of the VPC in which you launch your tasks. A VPC is a fundamental tool in AWS for controlling the networking capabilities of resources that you launch on your account. When setting up a VPC, you create one or more subnets, which are logical groups that your resources can be placed into. Each subnet has an Availability Zone and its own route table, which defines rules about how network traffic operates for that subnet. There are two main types of subnets: public and private. A browser or other client on the internet can send network traffic to the task via the internet gateway using its public IP address. The tasks can also send network traffic to other servers on the internet because the route table can route traffic out via the internet gateway. If tasks want to communicate directly with each other, they can use each other’s private IP address to send traffic directly from one to the other so that it stays inside the subnet without going out to the internet gateway and back in. There is no way for another server or client on the internet to reach your tasks directly, because they don’t even have an address or a direct route to reach them. This is a great way to add another layer of protection for internal tasks that handle sensitive data. Those tasks are protected and can’t receive any inbound traffic at all. In this configuration, the tasks can still communicate to other servers on the internet via the NAT gateway. They would appear to have the IP address of the NAT gateway to the recipient of the communication. 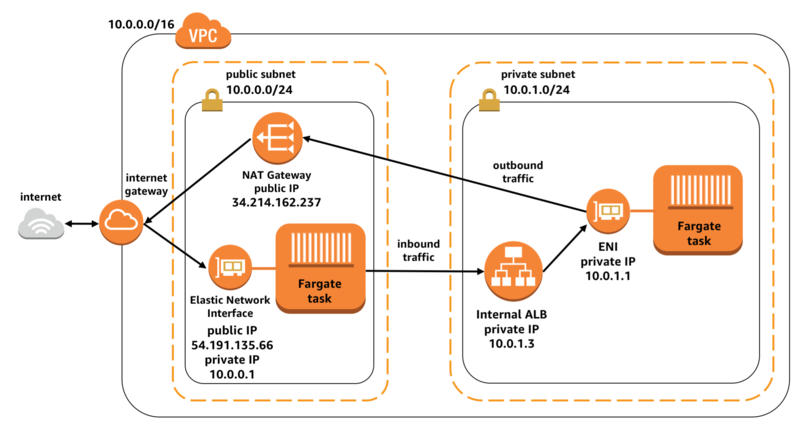 If you run a Fargate task in a private subnet, you must add this NAT gateway. Otherwise, Fargate can’t make a network request to Amazon ECR to download the container image, or communicate with Amazon CloudWatch to store container metrics. If you are running a container that is hosting internet content in a private subnet, you need a way for traffic from the public to reach the container. This is generally accomplished by using a load balancer such as an Application Load Balancer or a Network Load Balancer. ECS integrates tightly with AWS load balancers by automatically configuring a service-linked load balancer to send network traffic to containers that are part of the service. When each task starts, the IP address of its elastic network interface is added to the load balancer’s configuration. When the task is being shut down, network traffic is safely drained from the task before removal from the load balancer. This configuration allows your tasks in Fargate to be safely isolated from the rest of the internet. They can still initiate network communication with external resources via the NAT gateway, and still receive traffic from the public via the Application Load Balancer that is in the public subnet. With this approach, one container can distribute requests across an Auto Scaling group of other private containers via the internal load balancer, ensuring that the network traffic stays safely protected within the private subnet. Local task networking is ideal for communicating between containers that are tightly coupled and require maximum networking performance between them. However, when you deploy one or more containers as part of the same task they are always deployed together so it removes the ability to independently scale different types of workload up and down. In the example of the application with a web tier and an API tier, it may be the case that powering the application requires only two web tier containers but 10 API tier containers. If local container networking is used between these two container types, then an extra eight unnecessary web tier containers would end up being run instead of allowing the two different services to scale independently. A better approach would be to deploy the two containers as two different services, each with its own load balancer. This allows clients to communicate with the two web containers via the web service’s load balancer. The web service could distribute requests across the eight backend API containers via the API service’s load balancer. If you have tasks that require internet access and a lot of bandwidth for communication with other services, it is best to run them in a public subnet. Give them public IP addresses so that each task can communicate with other services directly. If you run these tasks in a private subnet, then all their outbound traffic has to go through an NAT gateway. AWS NAT gateways support up to 10 Gbps of burst bandwidth. If your bandwidth requirements go over this, then all task networking starts to get throttled. To avoid this, you could distribute the tasks across multiple private subnets, each with their own NAT gateway. It can be easier to just place the tasks into a public subnet, if possible. If you are running a service that handles private, internal information, you should not put it into a public subnet or use a public IP address. For example, imagine that you have one task, which is an API gateway for authentication and access control. You have another background worker task that handles sensitive information. The intended access pattern is that requests from the public go to the API gateway, which then proxies request to the background task only if the request is from an authenticated user. If the background task is in a public subnet and has a public IP address, then it could be possible for an attacker to bypass the API gateway entirely. They could communicate directly to the background task using its public IP address, without being authenticated. Fargate gives you a way to run containerized tasks directly without managing any EC2 instances, but you still have full control over how you want networking to work. You can set up containers to talk to each other over the local network interface for maximum speed and efficiency. For running workloads that require privacy and security, use a private subnet with public internet access locked down. Or, for simplicity with an internet workload, you can just use a public subnet and give your containers a public IP address. 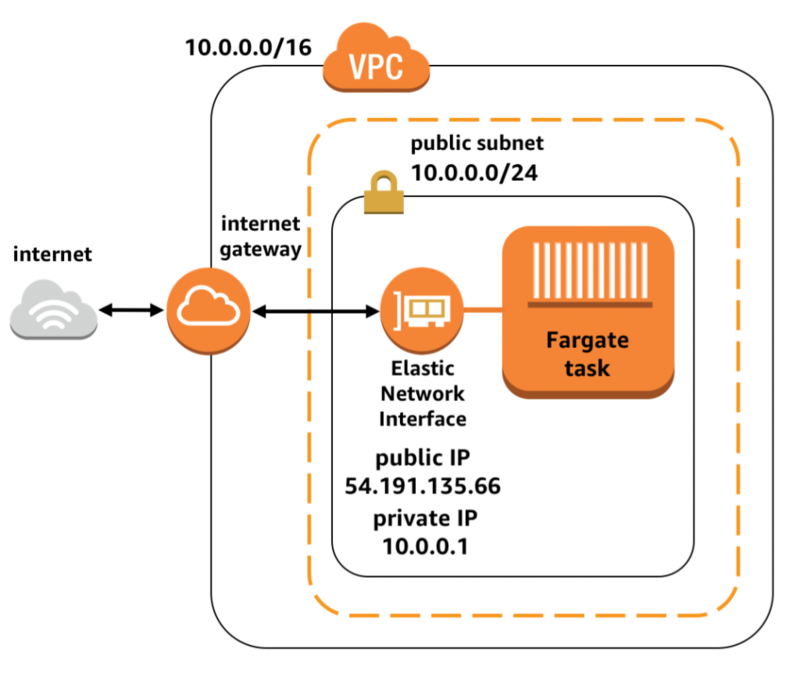 To deploy one of these Fargate task networking approaches, check out some sample CloudFormation templates showing how to configure the VPC, subnets, and load balancers.